Worked on this last night and I think I needed some additional continued bend/tilt after the TS. Felt solid impact without being steep. Correct. Tilt Switch just means switching from left side bend to right side bend. But most golfers have no idea that you must continue to tilt right all the way to followthrough position where left arm is parallel to the ground. Pros have way more right tilt at impact than most golfers realize. About 1/3 of the actual tilt is hidden by the rotation of the body looking at the pro from caddie view. I have had a lot of questions recently about my online Remote Lessons program. There seems to be some confusion about how it works, so here goes. First question I get is - "am I on the range hitting balls during the lesson?". The answer is, usually no - although it is indeed possible to use that option. Normally the lesson is done indoors at home or office in front of your computer or smartphone webcam. You just need at a minimum enough room in front of the computer to make a slow motion swing or a normal speed chipping length or half swing. Second is the video taping. Yes - you video your swing at the range (instructions on our site) and send me the video to analyze prior to the lesson via webcam. We review my findings together during the lesson. I will demonstrate your main swing flaws (usually limited to three maximum, often just one) and corrective drills and/or mental focus. I watch you and give you feedback as to how your body is performing the new move or the drill. So very much like an in person lesson and just as effective for about 80% of swing issues or short game or putting mechanics, as in person. Folks can sign up for just one single lesson (45 minutes minimum) or a series of lessons, which offer a lower price than the single lesson rate. Many of my students will opt for the series program and do a one hour lesson once every 4-6 weeks. It's a great way to build positive momentum and avoids the pitfalls of practicing by yourself for weeks at a time with no professional feedback. So right bend through impact and even after? Yes! Continuous right side bend all the way to Followthrough position, where left arm is parallel to ground. I can't unsee it now, thanks for tip! How’s this video showing the arms? From a left arm perspective in the backswing. Is the right thought to feel the arms move as you've mentioned throughout this thread WHILE maintaining left arm connection in the backswing? The way I'd describe the feeling is that the arms go away from the body as much as possible while maintaining left arm connection to the chest during rotation. Depends how you define "connection". The upper left should stay in contact with the left pec until end of takeaway BUT it is moving a tiny bit across the pec, ie not stationary. Due to 45 angle pushaway. After takeaway as right elbow folds, it raises the left arm totally off the pec, ie "dis-connection". Not as much as possible as a fact - 4-8" of handle motion in the pushaway. You defined connection how I would. Club has been slipping inside the last week or two. Tempo has been so good that I'm mostly getting away with it. But I don't want to get the arms moving away from the body and off the body early as an over correction. I am glad to see you are still watching this thread. I owe you a GIGANTIC thank you. The push-away you describe was a missing piece of my puzzle, a BIG one. I've spent a LOT of practice time away from the ball, and was able to take this new "feeling" swing to the course with the best ball-striking I have ever achieved, by far, especially with the driver. I wish I could see you in person just to shake your hand and say thank you. I also owe a big thank you to BallHiss, as his passionate post about RPM rate and synchronization really tied things together for me. It was another BIG piece of the puzzle. I've had at least 3 supernova light bulb moments since I began reading this thread 6 months ago, along with several smaller ones. Thank you Jim! You're welcome! Always great to hear about positive results from the ASI concept. RPM v MPH Illusion is a big one....arms and body moving same RPM speed from P6 to just after impact, or "SuperConnection" is super important concept. Put BallHiss in the search bar for this topic and it will come up. The first mention is a quoted post by PaulE dated 9th March 2014 but doesn't show the post number so I can't direct you to the post that way. Then there are a series of posts from him that you can read. Right elbow external and moving toward the belly button. Trying to get the clubhead to travel along the arc instead of down the line. Get right shoulder to the ball first then letting the club head move out to the ball. I've never been more open at impact in my life and the distance is unreal! I will post a video asap. It would be great to take a Go-Pro camera, strapped to one's chest, and film the swing. This would not only illustrate the motion from the point of view of the sternum, but when done for many people, categorize variations into certain groups. I don't know what those groups would be, but I'm confident there would be certain classes of motion. I have taken courses with Jim and he has a great way of explaining this and the many other mysteries of golf. With his help I progressed over the years from having never broken 100 to an 8 handicap today. I have more time scheduled with him in August. Hey D - great to see you participating in the thread! Would love to see more contributions from you here. D is a longtime student (1995 I think?) and a wise and serious student of the game. Love that Go Pro idea, excellent! One of my many ASI "thought experiment" drills is to imagine that you face/eyes is located on your sternum, what would you "see" during the swing, so right along with your insight. In a good golf swing, we do not swing "around" our body as many commentators say, we swing "around our FACE and vision line of sight" since our head needs to remain steady. Cool! Open with s girdle at impact and past is a great key to better striking. Right shoulder to ball first is my Inner Primary Power Source (for righties) or "what hits the ball". I am not seeing any push away or lift in Tiger Wood's swing, so I am not sure he does this move as is claimed earlier in the thread. Tiger Woods has a classic 1 piece move and turns the club with his shoulders. His arms and hands are passive. The natural folding of the right arm and rotation of the left arm after the first few feet is what raises the golf club. If you twist a video so he's upright it's clearer to see there is no pushaway and no illusion. Interesting video and of course Jim will have a proper response. But I would suggest firstly that because he (and many players) sets up for driver with his hands further from his body there is less pushaway in the swing. Secondly, most of the pushaway would actually be towards the camera therefore impossible to see from that angle (would need an overhead shot, ideally pointing directly down his spine angle from above). Thirdly, the pushaway is not the arm swing illusion so your last statement is pretty wild. No, you'd see it easily if he pushed the club down and scooped it outwards. The pushaway is a move claimed by Jim to be performed by several PGA Tour players inc Tiger Woods, but it's obvious Tiger has a classic 1-piece move. I believe in the arm pushaway. I have made the pushaway part of my backswing, and it gets me to a position at the top such that my instructor says i dont need to change a thing about it. 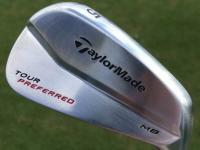 Other than the clubface is a little shut. Your understanding of the illusion is deeply flawed. Like many who visit this thread. Maybe try to have an open mind and look at overhead swing views of vast majority of modern tour pros and you will see through the illusion - hands in front of right side of chest at the Top, and wide. NOT pulled in and around the chest like almost all mid to high cappers do it. Tiger wrote an article in Golf Digest back in the late 90's when he was with Butch and in that article used the term "arm pushaway" and described it exactly the same way I do. His new swing has less of a pushaway than his old swing, but clearly still there. I do not - and never have taught - a "lifting" of the arms using the arm muscles in the backswing. Right elbow folding lifts the arms up, along with pivoting on a spine angle. The whole point of the takeaway aspect of the illusion is that the blending of the torso pivot with the pushaway hides the pushaway, ie literally an optical illusion. It can be quite small a motion, some pros as little at 2", average is closer to 6". Your understanding of the illusion is deeply flawed. Who said anything about the "illusion"? I didn't mention any illusion, I just said Tiger Woods doesn't push the club away from him which you claim he does. The video is conclusive proof - there is no scooping or pushing. His handle doesn't go down or out. And can you share this article? No I didn't think so. I believe you are confused. Butch used to like Tiger to have the feeling that he pushed his hands away from his head at the top of the backswing - back away from the target. This was not a move to start the backswing as you claim, it was a move to increase width and keep him from overswinging. He's also used this with Phil and Scott. I had a 3 day golf school at the Butch Harmon School of Golf in Vegas several years back and a small part of that time we got to have an hour or two with Butch himself and ask questions. I asked him back then what Tiger's takeaway feels were and he said "like most of my Tour Players we just like to move everything back in one piece maintaining the triangle". He later liked Tiger to have a little wrist ****. Maybe you confuse this with a pushaway...? I have also seen him hit balls in clinics where he's said the same thing himself. As above, he's never pushed the club away from him, as above his coach and his own books have clearly stated he moves everything back on 1 piece and his arms follow the rotation of his body. He neither pushes the club out or in, just a neutral takeaway like most coaches advise. So I think I'd believe what Tiger and his Coach say about his takeaway versus what you claim he does. The illusion is that when you blend the Pivot with the arm motion, the arm motion is masked. Duh! Did you actually read any of this thread with an open mind, or you just another Internet troll looking to pick a fight with a well-known golf teacher? Or is it rather that you lack good listening and reading comprehension skills? Tiger is clearly doing the arm pushaway in his current swing, just not nearly as much as in 1996. The fact that you cannot see it is your problem. He keeps his hands/arms moving in the backswing from center of his torso in the V shape up to the right side of this torso. In the third or "width" dimension. That move is the essence of what the ASI material is all about for the backswing. Your view of what I teach is obviously NOT what I teach. I teach a takeaway that is a blended motion of hips, core and torso pivot/torso tilting, a small arm pushaway of about 4"-6" for most students, and wrists c0cking and hinging. The concept of the Pivot moving the Triangle is a very important part of my swing model. I do not teach an outside the plane shaft in takeaway or an outside hand path either. I like a hand path that is straight back to slightly curving to the inside by last part of takeaway. Tiger was straight back along the toe line when that article was written, and today his hand path curves slightly to the inside. Most golfers new to the ASI concept form the false perception that I teach an outside, "steep" or vertical plane. Which is obviously what you believe I am advocating. I want wrists to start c0cking nearly right away, Tiger has always had a somewhat delayed wrist set. Pushing the handle end down is one way to get the wrists to start setting early. It is the way I teach it to most of my new students, but certainly not all tour pros do it that way. Pushing the handle down is NOT the same thing as keeping the hands/arms in front of the chest, two totally different things. Butch teaches arm extension, you are simply not credible when you claim he does not. And not just at the Top, the entire backswing. It is one of the three arm pressures that create the Triangle in the first place. I am looking at the Golf Digest article right now. I cut out the three page article, which I believe is from 1997 or 1998, page 40-43.Tiger in a silver print shirt. I use that article all the time in my teaching practice. Here are some qoutes: " Extending my arms with just a little wrist **** on the takeaway allows me to make a proper backswing It also helps me to keep the club on plane - note how the club is parallel to my foot line at this point." The photo with that text shows him in a classic Tiger circa 2000 end of takeaway position, very wide, looks like about at least 8" of pushaway, could be 10" even. Here is more Tiger: "Most amateurs could cure their power problems simply by learning to extend their arms in the takeaway and throughswing. Some experts describe this as a 'pushing away' of the arms from the body." So when Butch Harmon (who was Tiger's coach at the time) told me, in person, that Tiger just keeps his hands arms in place and turns his shoulders in a 1-piece move to start the takeaway - he was wrong? To be even clearer, Butch stood and demonstrated this in person in stages. First a perfect shoulder-only takeaway with absolutely no action from the arms or wrists (i.e no pushing away) he did this until the hands were just outside his right leg. Then he paused and folded his right arm a touch, another pause then pretty much turned to the top. I remember it like it was yesterday, he specifically stated this is what his players did and had in common and stressed there was no independent action from the arms until the right arm fold at the END of the takeaway. 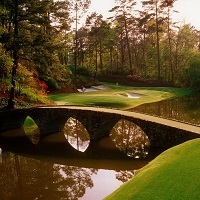 I am certainly not here "looking for a fight with a well known instructor" as you put it; but obviously I have Butch Harmon telling me one thing and Jim Waldron telling me something else - so it's about getting a better understanding. This tread has a ton of interest on WRX and on other sites too, so it's going to attract some attention, and sometimes scrutiny; but that's healthy, right? At least it should be. In the world of science it's all about challenging theories - that's how they stand up. Your view of what I teach is obviously NOT what I teach. Obviously there is no arm lift here so if you add a push-away the club would obviously move outside the plane-line? So what am I missing here? I would love to read this, I have a lot of Tiger articles books and clippings but nothing pre-1999. Would you be able to snap it on your phone and upload it? You really, really need to study this thread! I am always amazed when folks come on here who have literally no clue what I teach or what the ASI and then try to attack and discredit both. In the early days of the ASI research, I tested all possible takeaway options: inside (death move), way outside (death move), on plane (perfect), a little inside (okay, but easily crossed the line into too much inside, some due to pivot momentum acting on the arms and some due to the strong influence of the ASI to move too much inside with arms) and a little outside (also okay, but better results for most students who tried that option than a little inside). A little outside is therefore the preferred miss, and on plane is ideal. By your question now it is again totally obvious that you believe I teach a way outside takeaway - which is nonsense and not even close to being true. Tiger and some other guys today on Tour are a little bit inside with the hand path. I like a bit more outside with the hand path for most of my average golfer students. My track record of success with them is pretty good. You do understand you are a guy hiding behind a screen name and making a claim of having worked with Butch Harmon, which may or not be true? We have no way of knowing either way. But I have seen Butch work with several of his pros, including Ricky and Adam Scott, and he showed them the arms pushing out move. 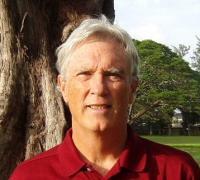 He is well known for this in golf teaching circles. And I am pretty sure Tiger was referencing Butch with his "some experts" comment in that article. So I am going to make a wild guess here that you just did not quite accurately understand what he was trying to communicate. But it really does not matter - for all I know Butch has changed his teaching on this point. This thread is about how I teach the golf swing, not Butch, in any case. I referenced the article - you can look it up online. I have an actual life to live and would rather do that than feed an internet troll. And in that article there is a pic of Tiger with an extremely large arm pushaway by end of takeaway - as I said much more than he shows today. And he literally uses the phrase "arm pushaway" in that article. I only responded with that reference since you seemed to go out of your way to attack my credibility by questioning why I did not post the article. To answer your question. you are "missing" quite a lot....for one thing the Pivot is not only turning your shoulder girdle 90 degrees to your spine. You also need to blend in moving from hip flexion to extension and add some left side bend or tilt. Both of those things also have an effect on the shaft plane angle. I did of course test the "neutral arms" option as I said above. It results in being a little under and inside with the shaft plane IF you do a proper pivot. And it tends to result - with average golfers especially - in folks pulling their arms way inside during second half of backswing. I show this exact demo in my arm swing illusion video - maybe you just get the video and study it and maybe then come on here and try to debate me - at least that way there is a chance (however small) that you would understand what you are talking about. I do not teach "lifting the arms" as you describe - folding of the right arm raises the arms. Pushaway during takeaway is mostly parallel to the ground, handle end raises only a tiny bit at the very end. And that pushing out is very small - 4-8" depending on the height of the golfer. The reason the shaft will stay on plane is because you are blending the arm motion with the pivot motion. When I finish the first 30 minutes demo of the ASI stuff in my golf schools, there is always one guy who will say to me "Jim - show me your backswing" So I do and then he says ""I don't see the arm pushaway".. My response is always, half serious and half joking, "that is why it's called a ******* illusion!". The fact that your eyes/brain/mind does not see it - in no way proves that it is not happening. By your question now it is again totally obvious that you believe I teach a way outside takeaway - which is nonsense and not even close to being true. 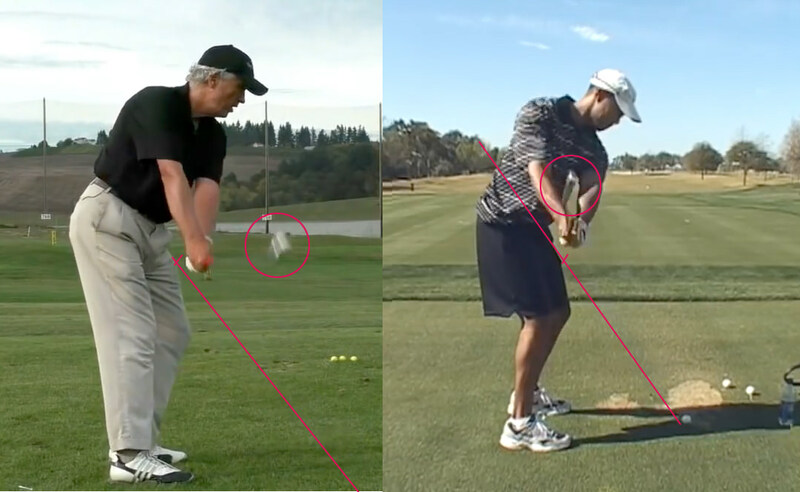 In your demonstration of the move on youtube you are more outside than Tiger, that's all I am saying. If Tiger was doing the push away wouldn't he be outside too? His hands / right elbow have gone in and yours have gone out (away from the small line). Nice try again, D - but once again, way off base about what I teach. Yes - I am a bit outside the plane on that pic, (although not as much as it looks camera angle is a bit off), the preferred error between a bit out and a bit inside as I said. I also make a point of exaggerrating the concept of "arms in front" to get the point across when first showing this to new students. There is tons of video in my program of me doing a takeaway directly on plane. Go read the Golf Digest article where Tiger says "arm pushaway" and DOES IT at a time he was working with Butch. My point being that you will be "outside and above the plane" if you fail to blend the pivot motion properly with the arm motion. If arm motion is too soon or too much, you will be outside. If not enough - inside. Folks struggle with this concept when first learning it because they are used to thinking in 2D - but your body needs to perform in 3D. You obviously do not understand how the blending part works - I get it, its a tough one for some folks. Pivot moves the hands/arms/club inside - at same moment in time arms move independently on the 45 angle to the right of the chest and in front of the chest - not around it. The only real debate is whether a slightly inside or on plane or slightly outside the plane takeaway is ideal for any one particular golfer. Every teacher has their preferences for this issue - and mine is on plane with a straight back hand path or very slightly inside at the end of takeaway.